Cape Town - Springbok coach Allister Coetzee, following Saturday's 18-17 win against France in Paris, has lauded the work done by his loose trio. 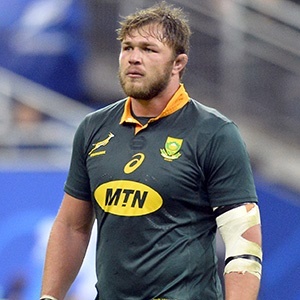 With Pieter-Steph du Toit out with a concussion, Coetzee recalled No 8 Duane Vermeulen to the Bok starting line-up for the first time since June last year in a move that saw Francois Louw move back into the No 6 jersey while Siya Kolisi played at No 7. READ: Bok ratings ... France were horrible! Positional changes in the loose trio have been common-place for the Boks throughout 2017 with injuries to Warren Whietely, Uzair Cassiem, Jaco Kriel and Jean-Luc du Preez at various stages of the international season ensuring that Coetzee has used numerous combinations. But, as he explained after Saturday's win, the Boks are currently employing a 'no number' philosophy in their loose forwards. What that means is that, as long as there is a lineout option in the loose trio, Coetzee does not place to much emphasis on the positions. Whether playing at No 6, 7 or 8, Coetzee expects his loose forwards to all be able to carry, play towards the ball and enforce turnovers. "We have a philosophy of no number on our backs," the coach explained. "As long as we've got a lineout option amongst the three to help with the jumping. We know they are all talented players. They can play towards the ball and they can carry." Vermeulen was the extra lineout option on Saturday, and Coetzee was extremely satisfied with his display. "Duane's role has been pleasing. He has been in our plans since the beginning of the year and he got injured. He's had a first start for us and it was a positive start," said Coetzee. "When Eben (Etzebeth) came off, I handed the captaincy over to Duane obviously, because Siya (Kolisi) was also off. He did a good job and I think he's just going to improve with every outing." Coetzee will have to mix things up once more for this weekend's clash against Italy in Padova. Kolisi will miss that match as he returns to South Africa for the birth of his child. It means that either Dan du Preez, who made his debut off the bench on Saturday, or Du Toit will start alongside Louw and Vermeulen. "I'm really pleased with that combination and with Dan du Preez, his inclusion in the team is about stopping power," said Coetzee. "I think we've got talented loosies and we're really fortunate to have that blend. Next week we have Pieter-Steph back which gives us a headache, but a good headache."